There is a feature bar and Lounge. We are situated in the centre of Chepstow close to train and bus stations. We are in an area of outstanding natural beauty, Wye Valley. Forest of Dean, Vale of Usk. Chepstow Castle, Tintern Abbey. Wye valley walk, Offa's Dyke Walk, Gloucestershire Way, All Wales Coastal Path all begin and end here. Private bathrooms, tea and coffee in room, towels provided, bedding provided. 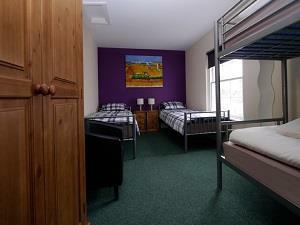 can be booked as single, family or twin room TV lounge available. By public transport: Chepstow train station 6 minutes walk. Bus station 5 minutes walk to town centre.